Undersecretary for Public Diplomacy and Public Affairs Richard Stengel (left) discusses America's initiatives to stop online recruitment for ISIL on Oct. 13 at the Quadrangle club. Alexandra Davis. 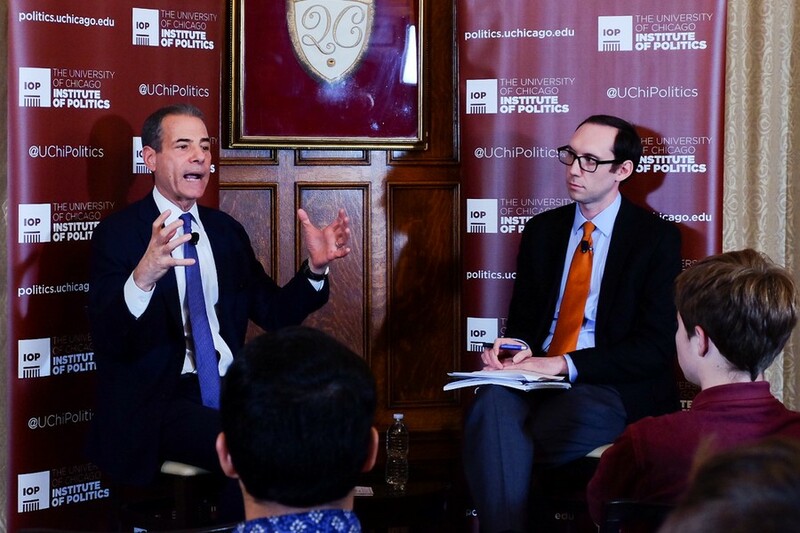 Undersecretary of State for Public Diplomacy and Public Affairs Richard Stengel discussed the Islamic State (ISIS)’s influential social media presence and how the U.S. can counter it on campus Thursday. The 90-minute discussion was hosted by the Institute of Politics at the Quadrangle Club. It focused on the work of the Global Engagement Center (GEC), a State Department anti-extremism initiative, which Stengel oversees. According to Stengel, the GEC, which began as the Center for Strategic Counterterrorism Communications, was founded in reaction to al Qaeda’s use of video-sharing platforms to reach a global audience. As the threat posed by al Qaeda diminished and ISIS, which Stengel refers to as “ISIL,” began to build a widespread and effective social media apparatus, the GEC switched its focus. Initially, the GEC focused on creating its own anti-terrorism content and media campaigns. Today, it primarily works to amplify the voices of global partners who oppose religious extremism, because these partners have more credibility with disaffected Muslims. According to Stengel, social media was essential to ISIS’s rise. “They were a niche brand that became a gigantic global brand in part because of the content they were producing—beheading videos, which young men like to watch,” he said. Although other terrorist organizations had used digital communications techniques before, ISIS reached a wider audience by linking its military effort and its communications effort. Filming battles and executions made ISIS victories highly visible, Stengel said. It also helped recruit foreign fighters. “They have a news agency…they have a media network of what we like to call ISIL fanboys,” Stengel said. In recent months, ISIS communications have diminished by as much as 70 to 80 percent, the State Department estimates. Stengel said that he sees this as a victory for the GEC. He said that increasing vigilance by content moderators on open social media platforms is driving ISIS members to end-to-end encrypted services such as Telegram and WhatsApp. These services are much harder for intelligence workers to access. Stengel believes that “the nexus between diplomacy and the information field and cyberwarfare” will increasingly become the site of global crises. As warfare moves into the digital space, information will become a weapon of international conflict. In response, he said, U.S. diplomatic agencies must begin to focus on creating and disseminating appealing messages. He cited World War I–era international broadcast entities as an example of outdated techniques.